Since the fall of 2000, Brent Shires has played third horn for the Arkansas Symphony Orchestra. He arrived in the state in 1999 to serve as the first full-time horn professor for the University of Central Arkansas, where he teaches horn lessons and serves as Brass Chamber Music Coordinator. He also teaches education-related classes such as high brass methods and brass pedagogy, and hosts many guest artists. Brent is an active performer outside the ASO as well, playing principal horn with the Conway Symphony Orchestra and third with Texarkana Symphony Orchestra, and is the founding hornist of Pinnacle Brass, the resident quintet at UCA. In the summers, Brent is a horn faculty member at Dixie Band Camp hosted at UCA, and Blue Lake Fine Arts Camp in western Michigan. He is a regular recitalist and clinician, appearing regularly in China and Taiwan. Brent grew up in the suburbs of Rochester, New York, where musicianship was encouraged early on by his school and parents (who now live in Little Rock). His mother gave him piano lessons for two years before he started on the horn in the fifth grade school band. In addition to weekly horn lessons, band and youth orchestra, Brent picked up the trumpet and learned jazz style in high school. 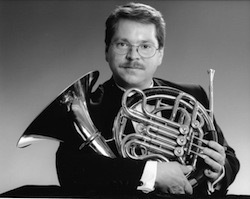 Dr. Shires went on to earn his bachelor's degree in music education at State University of New York - Potsdam, the MM degree in performance at Northern Illinois University, and the Doctor of Musical Arts from the University of Illinois, with research focusing on original works for solo horn and wind band. He also spent one semester studying at the Birmingham Conservatoire in England. His horn teachers include W. Peter Kurau, Roy Schaberg, Norman Schweikert, John Fairfield, and Kazimierz Machala. Brent has taken honors in several competitions - two university concerto competitions as a winner, and as a prize-winning finalist in the National Young Artist Competition of the Midland-Odessa Symphony. He has performed throughout the U.S., Europe, Australia and China; and has held positions in the American Midwest with the Green Bay Symphony, Manitowoc Symphony, Peoria Symphony, Champaign-Urbana Symphony, and Sinfonia da Camera. Dr. Shires serves the International Horn Society as Regional Workshop Coordinator and Arkansas Area Representative. He is also a board member of the International Horn Competition of America. Brent lives in Conway with his wife and accomplished pianist Terrie, and their two daughters. In his spare time, he enjoys studying languages, remodeling his home one room at a time, and cooking Asian food. Countdown to ASO Giving Day! A donation to ASO puts instruments in the hands of children, makes live symphonic music accessible to all Arkansans, and makes it possible for world-class musicians to call Arkansas home. Every dollar counts, and each donation helps ensure a sustainable, thriving future for ASO. Want to be 'in the know' of ASO news? Sign up for our newsletter to receive our latest concert announcements, special offers, upcoming events, and more! The ASO exists to connect, enrich, inspire and advance Arkansas through the power of music. © 2017 - Arkansas Symphony Orchestra. All Rights Reserved.